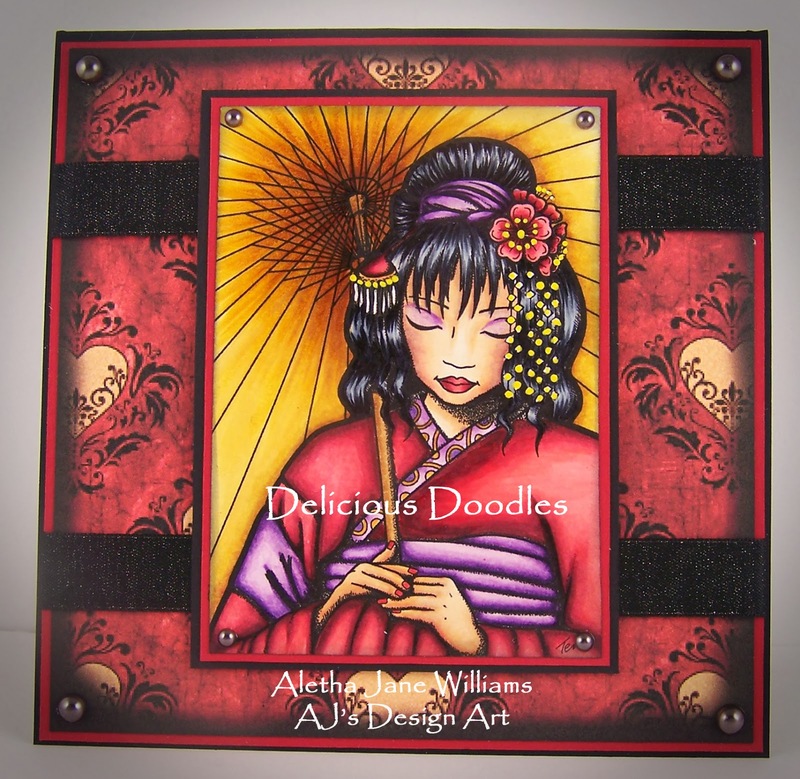 It’s Friday and time for another amazing challenge at Delicious Doodles. This week we want you to “use ribbon.” And you can interpret that however you want. Remember, if you use a Delicious Doodles image, you entry is counted twice. Why wouldn’t you want to use a Delicious Doodles image? What comes out of Teri’s imagination, you will be amazed. There is something for everyone’s taste. I chose a very serene image for my art card. This image is “Quiet Contemplation.” I love everything Asian, and this one fist the bill. I colored her with my Copics. My background paper is also designed by Teri. It is “Swirly Heart Papers,” and I used the red version. You do get several colors with your purchase. 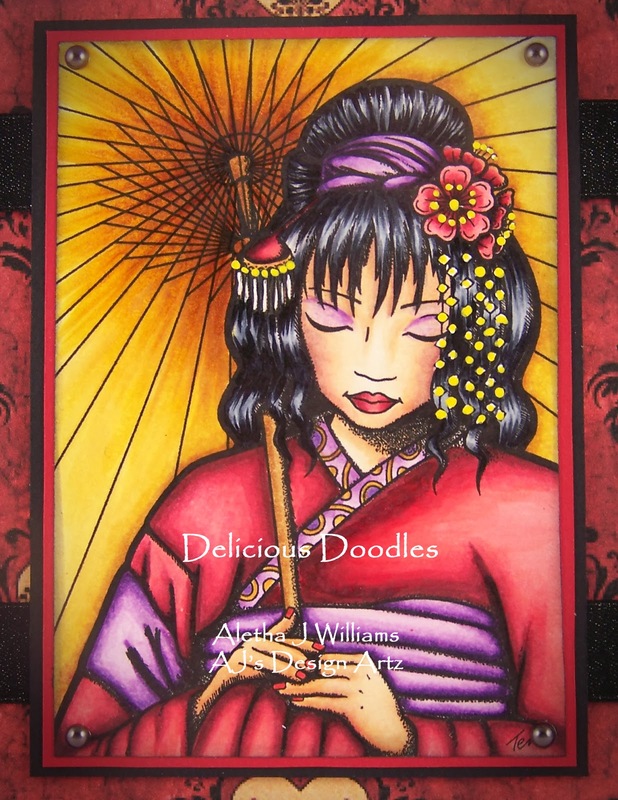 My cardstock is Stampin’ Up!’s Basic Black and Real Red. I used some black ribbon from Really Reasonable Ribbon. It is one of my favorites in black. There’s an iridescence quality to the finish. For the last embellishment I added some pewter colored flat-backed pearls. That’s it for today. I hope you join us for this Delicious Doodles Challenge. 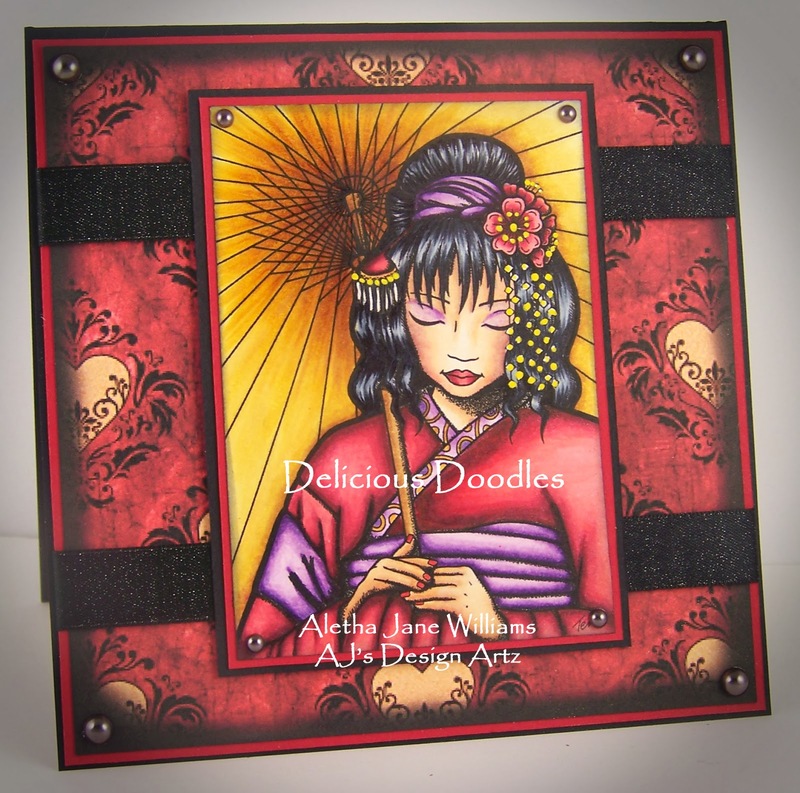 And, if you use a Delicious Doodles image, come share it over at our Delicious Doodles Facebook group. I always thought this image was pretty but was never really inspired by it. But dang girl you have totally ROCKED this image out of the HOUSE! So stunning, amazing, astounding, and just plain beautiful! Not that this card is plain! Love this girl! and of course Love you!